Broadband capacity is stretched to the limit during peak hours. NEW YORK ( TheStreet) -- Netflix ( NFLX - Get Report) has seen rapid growth recently, with shares up +215% in the last 12 months compared with about +15% for the Dow Jones, and a stunning +550% in the last five years vs. just +10% for the Dow. Part of that success has hinged on the company's seemingly seamless transition from dominant home delivery of DVD rentals to more streaming content and partnerships to provide online movies through various gadgets -- from wired BluRay players and HDTV's to video game consoles. But what would have happened to Netflix if, five years ago, the U.S. postal service was overwhelmed by DVD mailings and movies didn't reach your house via the mail until weeks after you ordered them -- if they arrived at all? NFLX stock not only would have missed out on all its growth, it may have gone out of business entirely. That is exactly what Netflix now faces in digital form -- since broadband capacity is now stretched to the limit thanks to the popularity of streaming video. 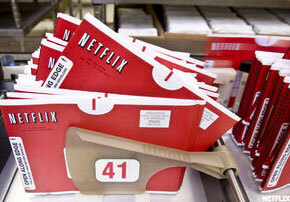 The data demand caused by Netflix could soon become enough to crash the Internet altogether. NFLX certainly isn't the only offender in this streaming video glut, but it is one of the biggest with over 15 million subscribers and most of them watching video for a few hours and not just a few minutes like those seeking cute pet clips on YouTube. What's more, its recent expansion of Netflix streaming video service in Canada could add even more rapid growth to its user base. And here we arrive at the problem: According to Sandvine, a network management company that studies Internet traffic patterns, 10% of Canadian Internet users visited Netflix.com in the week after the service launched. Subsequently, Netflix videos dominated broadband lines in our neighbors to the north -- so much so that at peak hours (around 9 p.m.) the service accounted for more than 90% of the traffic on one Canadian broadband network according to Sandvine. And this is just in the first few weeks of the service being offered. Imagine what will happen as more folks hop online, more movies are added and the general growth of Netflix continues. It's not just Canada, either. Netflix accounts for 20% of downstream Internet traffic during peak home Internet usage hours in North America according to Sandvine. That tops YouTube, iTunes, Hulu, peer-to-peer file-sharing services -- you name it. In many ways, Netflix is the victim of its own success. It has signed some good content deals with major TV networks and movie distributors in the last year or two -- most recently a five-year, $1 billion deal between NFLX and cable network Epix, the joint venture owned by Paramount Pictures, Lions Gate Entertainment and MGM. But Netflix may not want to grow too big too quickly. If it winds up crashing the Internet in Canada -- or even in regions of the U.S. --- customers may move away from the streaming video provider just as quickly as they jumped on board. As of this writing, Jeff Reeves did not own a position in any of the stocks named here.